This is one in a series about Winnipeg's deadliest fires. Today, 776 Main Street is a garden space adjoining the International Harvester / Vineyard Church building. 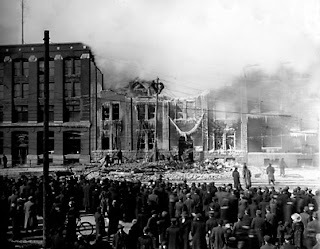 On Saturday, March 9, 1912, it was the scene of the fifth deadliest fire in Winnipeg's history killing seven people, including two firemen, and injuring dozens more. 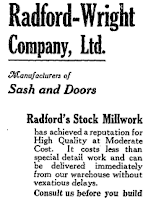 The Radford-Wright Company was a door, sash and millwright company based in Oshkosh, Wisconsin. 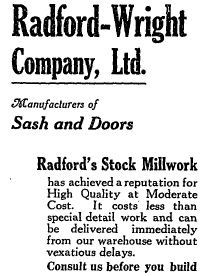 In 1910, it dispatched E. M. Simonson to Winnipeg to establish a Canadian branch. 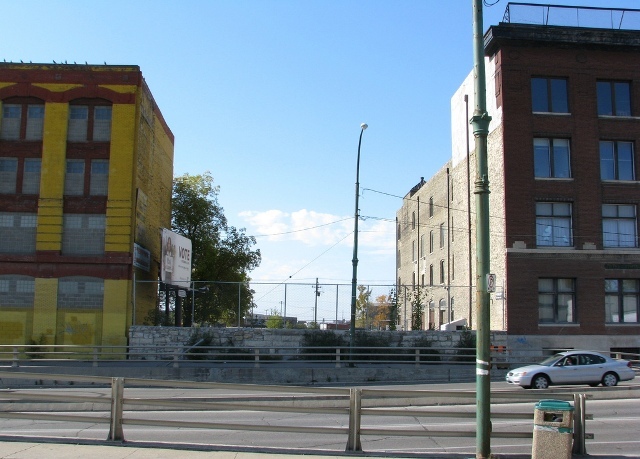 The company purchased 776 Main Street, the former Parlin and Orendoff Canadian Plow Co. building located just north of the Higgins Avenue subway. 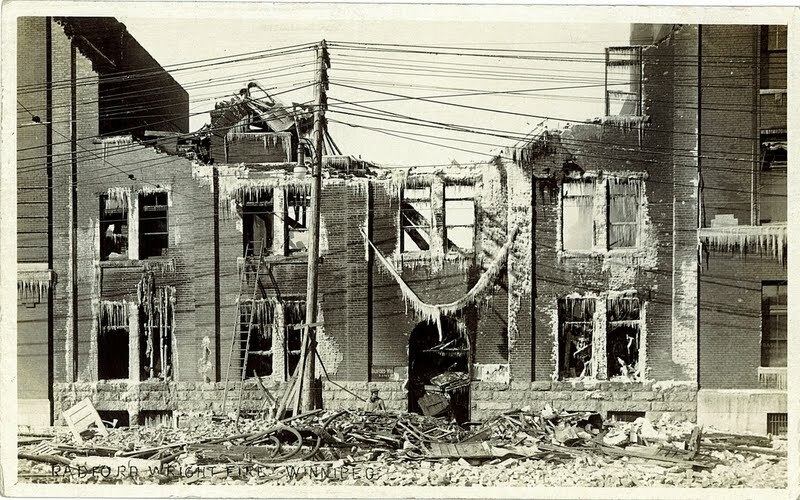 On the night of Saturday, March 9, 1912, a fire started in the lean-to annex at the rear of the building. An employee working late at the neighboring Stuart Machinery building noticed the smoke and ran to a nearby fire call box. He also notified a policeman on the street. Firemen from nearby Fire Hall No. 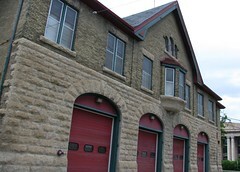 3 on Maple Street, (now the Winnipeg Fire Fighters Museum) arrive on the scene in just a couple of minutes. They had just started spraying the annex when an "explosion that shook the earth for blocks around” occurred. It blew open the massive cargo doors sending flames and shrapnel into the faces of the firemen. Then, the top portion of the rear wall collapsed to the ground, pinning five of them under two-metres of rubble. Around front of the building, that same explosion sent debris, live power lines and streetcar lines crashing down onto passers-by. The neighbourhood was plunged into darkness. A general alarm was immediately called in and crews from most of the city's fire halls and every on-duty ambulance were summoned to the scene. Rescuers dug through the rubble at the rear of the building to get at the trapped firemen. 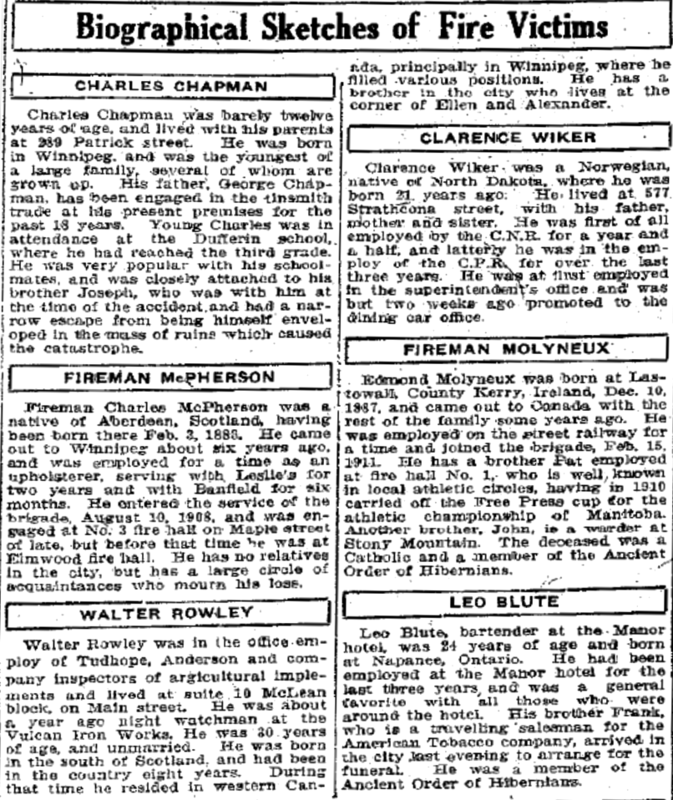 Charles McPherson was crushed to death, but Edmond Molyneux was just barely alive. They were rushed to St. Boniface hospital where Molyneux regained consciousness just long enough to witness the last rites being given to his colleague. He then died. The same two men had responded to a hay barn fire earlier in the evening and both had to be pulled from the structure, unconscious from smoke inhalation. 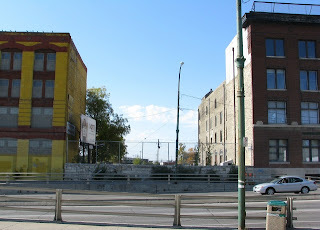 The main floor of the Sutherland Hotel became a makeshift field hospital and morgue for the other victims. Ambulances were routed there and a doctor was dispatched. Police Sergeant Patrick, who was teaching a first aid class nearby when heard the explosion, brought his entire class with him to investigate and treat the wounded. Newspaper accounts from the Sutherland describe a terrible scene of crushed bodies with missing limbs and the bloodied, bandaged wounded, either lying on the floor or shuffling around the lobby in a daze. The din was interrupted by the odd cry when someone discovered a dead loved one. Adding to the chaos outside was the lack of streetcar service. 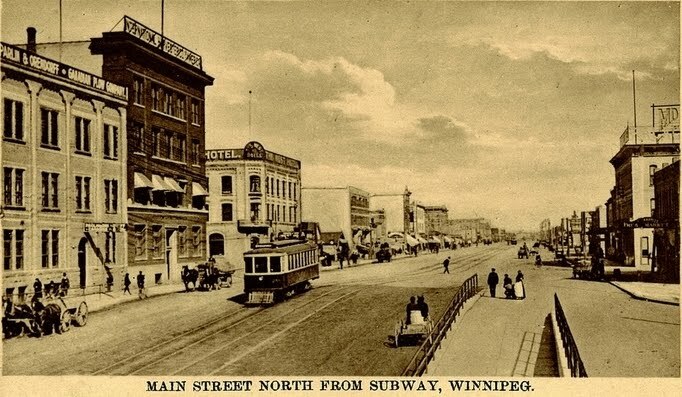 The only access to and from the North End at the time was the Main Street subway. Late movies and a big hockey game recently let out downtown and thousands of people had to squeeze through the disaster scene to get home. The building continued to burn and disintegrate into the next afternoon. It was only then that the rubble along Main Street was completely searched and a final body pulled out, that of 12 year-old Charles Chapman of Patrick Street who was attracted to the scene by the sound of the fire engines' gongs. Funerals for most of the dead were held on March 12th. They were spaced throughout the day tro make it easier for those who had to attend multiple funerals. Top: The New York Times. Bottom: Brandon Sun. 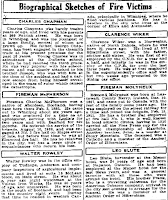 Newspapers from around North America reported on the tragedy and there was a great deal of pressure on fire officials to discover what caused the blaze. They eventually determined that the cause of the fire was arson and the resulting explosion was due to naptha, a chemical stored in large quantities at the site. It would take over a year, though, before police got a lead in the case. 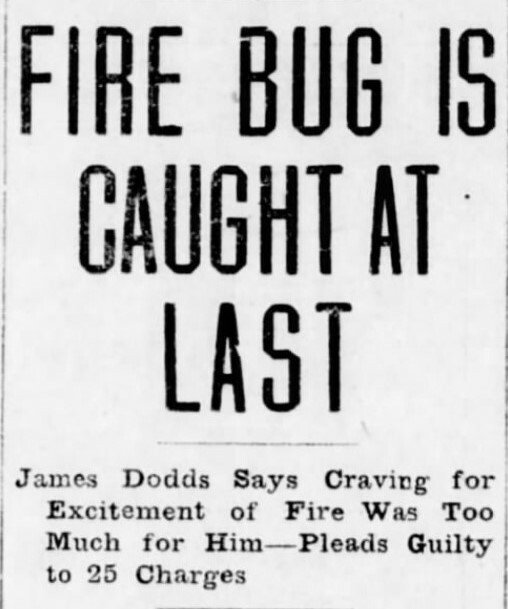 In the end, Dodds was charged with just the ten worst arson cases as prosecutors concentrated their efforts on the manslaughter charges related to the Radford Wright fire. Dodds said he set a number of small fires while strolling down Sutherland Avenue that evening. When he crossed Main Street, he did the same behind Radford-Wright using some hay and bits of cardboard and then retreated back across Main Street to watch the fire take hold and for firemen to arrive. When the explosion occurred he fled a short distance away but soon returned to look at the bodies in the street and watch the rescue efforts unfold. He stayed at the site until 3:30 a.m. then returned the next day to take photographs of the aftermath. "You are a menace to the community and in any case you are a dangerous man to have out.... I will ask the prosecuting attorney to confer with the attorney-general's department as regards to an investigation of your sanity. There is little question in my mind but that you will be found to be a monomaniac. " 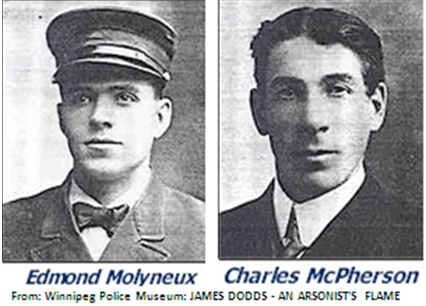 Dodds was examined and found to be a "maniac incendiary and in May 1913 was transferred from Stoney Mountain Penitentiary to the Brandon Asylum. 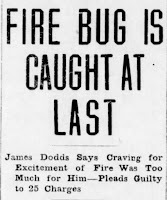 In July 1913, Dodds was back in court to hear the manslaughter charges read against him but it never went to trial due to his insanity. He was instead sent to the Selkirk Asylum for a period of ten years. In October 1913, the attorney general's department made arrangements for Dodds to be released and deported back to Scotland under the car of his brother, John. The family paid for his passage home. Charles Chapman, the 12 year old victim, was my great uncle. My grandfather, his brother, was only three years older than he was. His other brother, Joseph Chapman, was also close to being killed, but as the building front fell into the street a live electrical wire flew forward and threw him into the street. Joseph went on to serve in the Canadian Army in WWI and moved to BC upon his return from the war, where he died in the 1960's. Charles was not so lucky and was crushed under the building. Sorry, I just came across this comment. Thank you for adding it. It's great when family cam fill in some of the pieces.